Program Evaluation 4 Edition A highly esteemed and comprehensive overview of program evaluation that covers common approaches, models, and methods. As schools and other organizations increase their demand for information on program effectiveness and outcomes, it has become even more important for students to understand the prevalent approaches and models for evaluation, including approaches based on objectives and logic models, participative, and decision-making approaches. 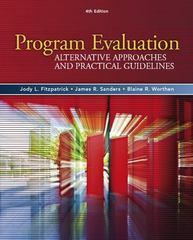 The new tenth edition of Program Evaluation not only covers these vital approaches but also teaches readers how to best mix and match elements of different approaches to conduct optimal evaluation studies for individual programs. Helping both students as well as professionals who are new to the field, this text provides practical guidelines for conducting evaluations, from identifying the questions that the evaluation should address, to determining how to collect and analyze evaluative information, to ascertaining how to provide evaluative information to others. Making extensive use of checklists, examples, and other study aides, Program Evaluation teaches students how to effectively determine the central purpose of their evaluation, thus making their evaluation more valid, more useful, and more efficient. The revised edition of the text includes new approaches to program evaluation, an expanded discussion of logic models, added information on mixed models, and, as always, updated coverage of the most current trends and controversial issues in evaluation.